This remarkable set of still-lifes depicting The Twelve Months of the Year in Flowers was the result of the collaboration of three leading figures in their respective fields in England in the first half of the eighteenth century: the artist Pieter Casteels, the engraver Henry Fletcher, and the nurseryman Robert Furber. 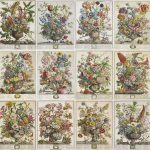 Undertaken as a commercial venture in order to sell bound sets of hand coloured engravings to a group of subscribers, it also served as a showcase, by acting as a high-quality seed catalogue, for Furber`s nursery at Kensington. This was the first commercial horticultural catalogue of its time and as such, it represents a defining point in the history of botanical illustration and horticultural literature in Britain. This celebrated set of engraved plates, one for every month of the year, consists of an appropriate arrangement of flowers in a vase. In each print the individual plants are numbered with a corresponding key listing them by name at the bottom, thus enabling customers to easily identify and order them. Over four hundred separate species are depicted. The plates were advertised in Fog`s Weekly Journal of 25 September 1731 as being “completely furnished” and ready for delivery. In the same notice subscribers were asked to send their receipts, with the remainder of their subscription money, to Robert Furber, gardener, at Kensington; Peter Casteels, painter, in Long –acre; and Henry Fletcher, engraver, in Nottingham Street, near Plum-Tree Square. In a post- script it was announced that sets were available, to non-subscribers, at £2.12sh.6d with the plates coloured and £1.5sh.od with the plates plain. A thirteenth plate, issued later, consists of a list of the subscribers, engraved within a floral border and a dedication to Frederick, Prince of Wales and Anne, Princess Royal. The three entrepreneurs had ventured £500 on the scheme but found 457 subscribers, thereby netting themselves each a handsome profit even before further sales of the prints, the plants or the original paintings. Its success led to the publication of a companion series, the Twelve Months of the Year in Fruit of 1733, which Casteels also designed in conjunction with Furber. Several plates from that set were also engraved by Fletcher. The interest aroused by this venture was to inspire Jacob van Huysum, brother of the famous Jan, who had recently moved to London from Amsterdam, to paint between 1732-6 his own set of Twelve Months of Flowers. Robert Furber (c.1674 – 1756) established his Kensington nursery soon after 1700 near Hyde Park Gate and Kensington Gore. He bought some of the plants collected at Fulham Palace by Henry Compton, Bishop of London, after the bishop’s death in 1713, and by 1724 his stock was rich enough for some of his exotic trees and shrubs to be listed by Philip Miller in his Gardeners and Florists Dictionary (1724). A member of the Society of Gardeners, by 1727 Furber had issued two catalogues of his own, one of English and Foreign Trees, the other of the Best and Choicest Fruit Trees. But it was with his pictorial catalogue of the Twelve Months of Flowers that he made his name. The popularity and success of the original series of this set is attested to by the fact that between 1732 and 1760 no less than six pirated publications, with reduced copies of the plates, were being offered for sale. 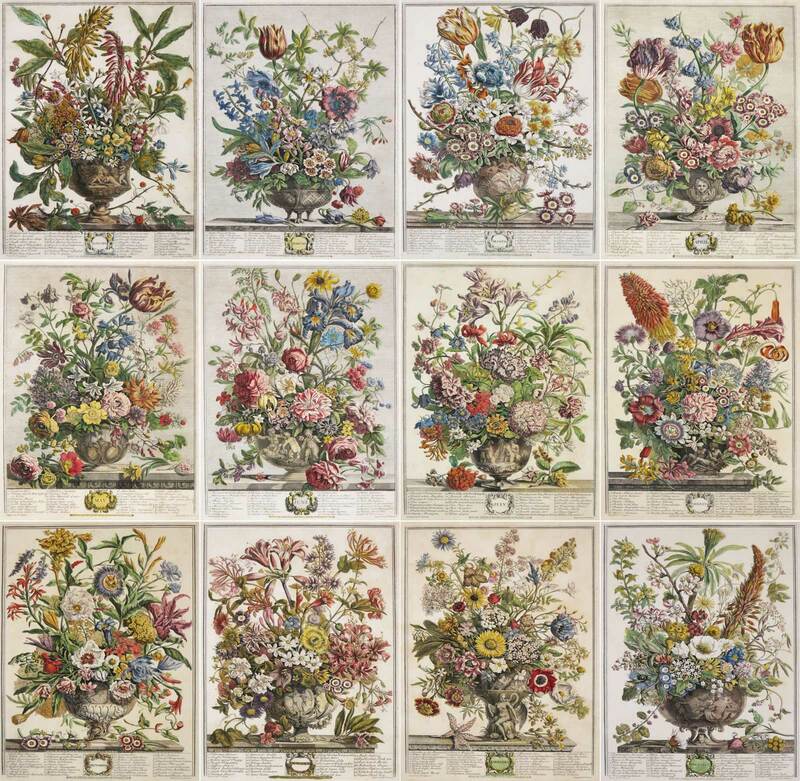 With his set of the Months of Flowers Furber also indicated their “season of blowing”, their suitability for open borders, edgings or pots, and their need for cover against summer sun or winter frost or protection in a greenhouse or stove. In all, this amounted to a thoroughly practical and useful guide to the amateur or professional gardener who, for the first time, could select the plants he liked the look of, assess their suitability to his ground and then order them from Furber`s nursery. The artist Pieter Casteels was born in Antwerp in 1684, the son of Pieter Casteels who was also a painter. He was trained by his father and in 1708 arrived in London with his brother-in-law, Peter Tillemans, having been offered work by a picture dealer. He settled readily into London’s artistic community, subscribing to Kneller`s Great Queen Street academy in 1711 and becoming a member of the Rose and Crown Club. Although he returned briefly to Antwerp in 1716, Casteels settled permanently in England where he was a leading painter of flowers and exotic birds, chiefly for overdoors and chimney-pieces. In 1726 he launched a subscription for a set of twelve prints of birds that he had etched after his own designs, this being the first work in that kind of his doing. The success of this project encouraged him to undertake the publishing ventures of the Twelve Months of Flowers and then the Twelve Months of Fruit. Henry Fletcher (active 1715-44), the engraver, lived in London but nothing is known of his background. Initially he worked for booksellers, and in 1715 produced a portrait frontispiece to Robert Nelson’s Works. Later he also worked for printsellers, producing plates for publication such as Bernard Baron’s 1728 set of Seven Acts of Charity, and in the following year illustrations for a Story of Bathsheba after Sebastiano Conca. By that time, however, Fletcher was also working on the subjects from natural history for which he became best known. He engraved fifteen plates (dated 1729) for the Catalogus plantarum, A catalogue of trees, shrubs, plants and flowers, both exotic and domestic, propagated for sale in the gardens near London by a society of gardeners (1730), shortly before engraving the Twelve Months of Flowers. He followed this with engravings for Charles Collins’s Twelve Prints of English Birds (1736). Much of his later work was topographical producing views of Venice after Canaletto and views of London after Joseph Nichols. He was listed by Vertue as being “an active” engraver in 1744 but no work of later date is known. As one of the largest and earliest sets of coloured engravings in the history of English printmaking, it is increasingly rare nowadays to find a complete group in such fine condition. Being perhaps the first known mail-order catalogue in terms of advertising, individual plates have very often either been lost through usage, or the attractiveness of each month has resulted in sets being divided within families according to various birthdays. The everlasting appeal of this group of engravings, however, remains a testament to skill of the artists who created them.